I saw this van in Hove recently. 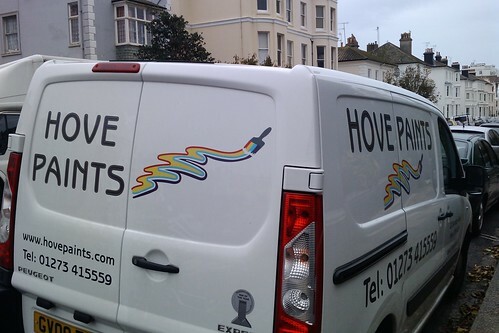 So, ‘Hove Paints’… what do they do? They probably don’t do painting, although they could do painting. They probably sell paint. But what kind of paint? Is it paint for artists? Or paint for children? Is it paint for your living room? Or paint for factories? Do they sell to ordinary people? Or are they just a trade supplier? If you’re going to create a mobile advert by painting your van, why not be clear about what you do, and who you do it for? If they did do painting, these van decals would be a good start: the company name is a working sentence and the graphic shows the act of painting, rather than paint as a product. And yet I also guess they just sell paint!